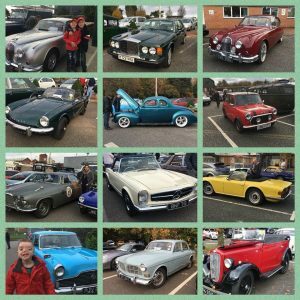 Back in November 2017 my son Harry was the inspiration for a huge rally of classic cars through Liverpool in aid of raising funds for the charity I have founded to raise awareness of facial disfigurement called More Than a Face. 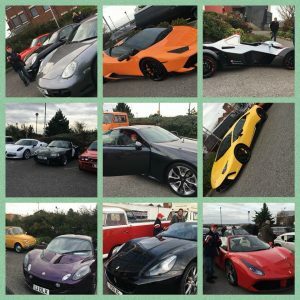 It was a fantastic day which raised over £2000 towards the £5000 I needed for registered charity status and while we were there we got chatting with several of the car owners and supporters. One of those was a gentleman called David who very kindly told me that he owned a lodge in the lake district and would like to gift us a week there as a family. On top of the fund-raising kindness of the day I was totally overwhelmed by this offer and kept in touch with David in the next few months. 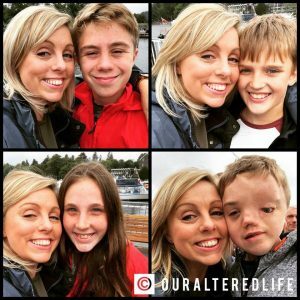 Fast forward to August 2018 and we finally arrived at the Lodge for our first visit to the Lake District! As I say, the lodge was gifted to us unconditionally but its not in my nature to take and not give back so I have created a short YouTube clip to show just how stunning the lodge was, in the hope that David may receive some enquiries! Please do check it out (below) and give it a share. The lodge itself was 5* home from home with absolutely everything you could ever need there (including a bottle of wine in the fridge!). The quality of the furniture and finish of the décor was just stunning and we really were amazed at how beautiful our new home for the week was. 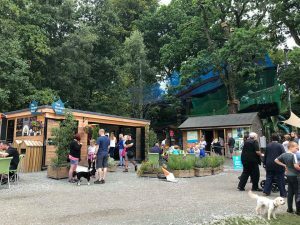 On site (Limefitt Park), there is a small shop which I was pleased to see didn’t have the inflated prices that many on site shops have, a lovely children’s adventure playground, a field just for dogs and a field with football goals. We weren’t blessed with the best weather but we were able to enjoy all the facilities for short periods of time and it was really lovely to be able to take the dog with us as Sherlock can often miss out on breaks where dogs aren’t quite as welcome. There is also a laundrette and an onsite pub where you can pick up a Wi-Fi signal, grab some lovely food and enjoy a game of pool or darts. There’s even an xbox 1 with a few games to keep the kids happy! 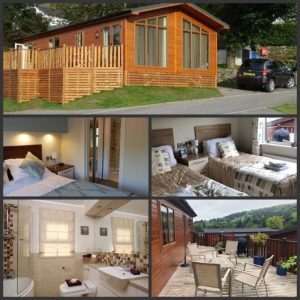 The lodge is situated on Limefitt Park in Trout beck which is about 8 minutes from Windermere and Bowness and really well placed for exploring areas such as Kendal, Ambleside and Hawksead. We met up with some friends during the break who are seasoned Lake lovers and they commented on what a great location it was (they also told us we should have packed wellies which we hadn’t done – rooky error!) and we have already said that we would really love to go back. Taking Harry, who is autistic, away from his home comforts can be a challenge at times. He relies on routine and wifi, neither of which we had at the lodge so it was important that we planned a few things into the week so that I could tell him a bare bones structure even if we didn’t have every minute planned out. On the Monday (arrival day) we spent some time before check in at a gorgeous local pub called the Queens Head and the we explored the site and spent some time at the playground. On Tuesday we visited tree top nets, Wednesday we met with Terri my blogger friend from The Strawberry Fountain with her hubby and boys, on Thursday we took a lake cruise and Friday we had planned to explore Kendal but the weather was against us and Harry became quite distressed in the morning so we headed straight home which was just as well as the 2-hour journey took almost 4 in the bank holiday traffic! The two main activities for the week were both brilliant and very different. Tree top nets is, as it sounds, huge nets suspended high up in the trees of Brockhole near Windemere. Tree tops nets and coffee shopThere was a brief safety talk before we headed in but to be honest, it was more about common sense as the course is incredibly safe with net walls surrounding you and secure nets below you! There’s no need for a harness as you can run around freely (even though it feels very weird to run on ground which is giving way beneath you and makes you look a bit daft!). 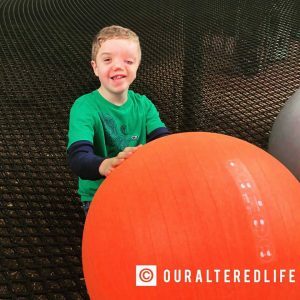 There was a section with huge inflatable balls which could be thrown at each other and various tunnels and slides to get you between the different layers and zones. I did like that there was a ‘quiet zone’ for children who may feel a bit overwhelmed by the excitement and I took Harry there a couple of times. We had 2 hours on the course which felt like loads of time and could come off and go back on at any time as long as we showed our wrist bands. One of the things I loved the most about the session was that we were all able to do it together. 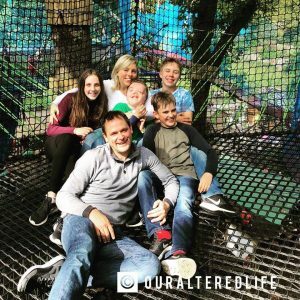 I realise this sounds minor but when we have visited attractions such as the harnessed mid-air courses, Andrew or I have joined the three children and the other adult has had to wait with Harry who couldn’t possibly participate. 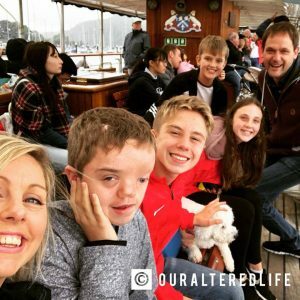 Much like a family where there are older children and very young children I imagine where the abilities vary greatly so it was brilliant to all be enjoying something together. We all really loved it and had burned off enough calories to enjoy a hearty lunch at the café on site afterwards. Brockhole itself is an area of beauty and adventure. 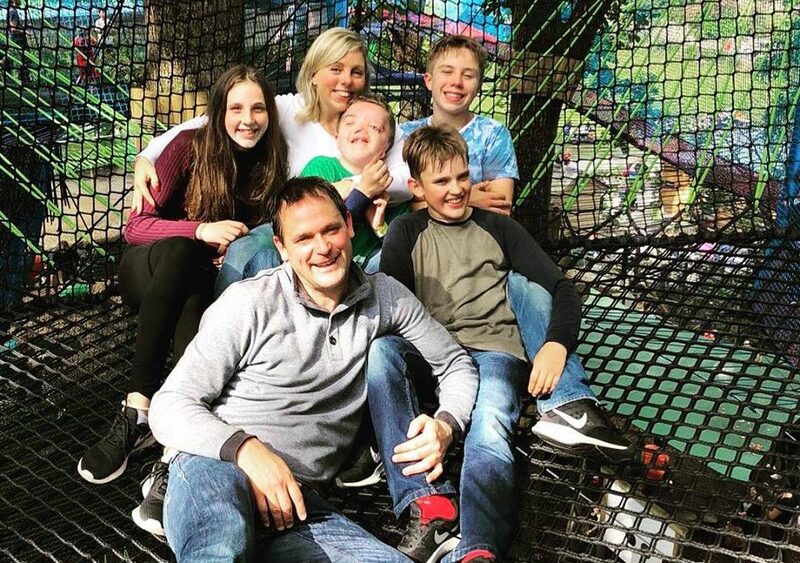 As well as the tree top nets there is the tree top trek, archery, ‘brave the cave’, bike hire, fell pony rides, garden trails and orienteering, laser clay, mini golf and the free adventure playground! There really is something for everyone there and I would highly recommend it although I would advise checking the prices out first before sharing the options with the children who would no doubt want to do them all! On Thursday we decided to explore the area on water with Windemere Cruises. There are loads of options to buy tickets for specific routes if you know where you want to visit but as we had no idea, we opted for the Freedom of the Lake ticket which gives access to any of the boats and routes so you can come and go as you please in a 24 hour period. 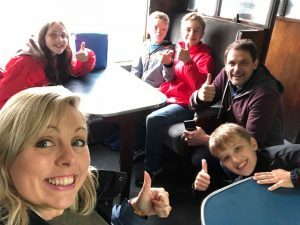 We got on the first boat at Bowness and went over to Haverthwaite where we jumped on a steam train and went for chips and ‘thunder and lightning’ ice cream which was so delicious that we ate it all and took no photographs! 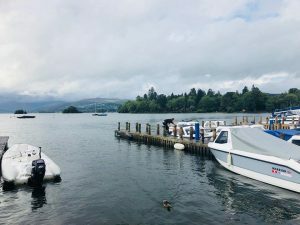 We then caught a different boat back to Bowness and although we had considered venturing on to Ambleside, the weather had turned and the children were getting tired (fresh air is the best natural sedative!) The boat rides, steam train journey and stop off took us 5 hours and we all agreed that it had been an equally brilliant, although much less energetic, day to Tuesday’s tree top experience and we would definitely do it again as there are so many other attractions that you can visit and combine boat ride tickets for such as the aquarium and motor museum. 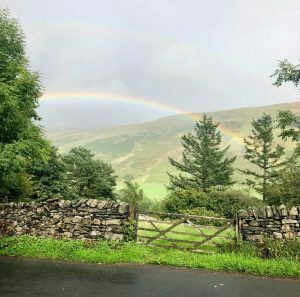 If you’re not a fan of driving around on what can sometimes be narrow lanes in the Lake District then this is the perfect way of seeing loads of places with none of the stress! At the end of our first visit to the Lake District we are all huge fans and can’t wait to return although I think the 5 days with limited Wifi was enough of a test for Harry so I think we would aim for the same amount again and we will definitely be looking into dates and prices for Glenwood Lodge again. Although we will be sure to pack wellies next time. The scenery and peace might be guaranteed but we cant say the same about the weather! 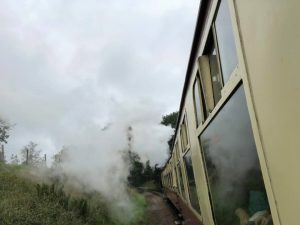 The scenery and fresh air – Stunning views everywhere you looked and air that felt pure and refreshing! How welcome dogs are everywhere – In most shops and pubs which made life so much easier than having someone on dog duty sitting outside all the time or leaving him in the car which distresses him. How friendly everyone is – Sure they have to be friendly in a tourist area but you sense that its more than that. It’s like stepping back in time to days when communities were built on conversation and connections rather than texts and followers. Wholesome and comforting. The variety of things to do – Walking is free but if you prefer looking at the scenery than trekking through it then there are no end of places to visit and things to do. There’s something for every age and budget! The lack of Wi-Fi – (For me, not Harry) Yes, this is a strange one for me who is a self-confessed social media addict but it did me the world of good to disconnect from the world for a while. As a family we played more board games in the 5 days than we have all year and I read one and a half books. Every time I go away I remember how much I love reading but within no time at all I am back to my usual routine at home and the kindle lies redundant in my drawer. I MUST make more of an effort! Maybe the Lake District is just the retreat that we need. I love that idea. Have you ever visited the Lake District? If so, where else would you recommend we visit? The tree top nets experience and Freedom of the Lake tickets were gifted to us in exchange for a review. All views are my own. Oh it looks amazing! That amazing shot of the rainbow! Oh it looks amazing. I have always wanted to go to the Lakes but it’s one of those places we have put off over the years. 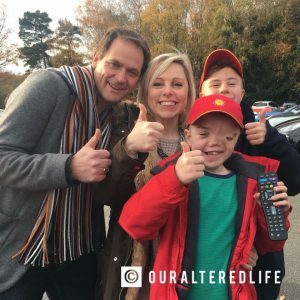 I’m desperate to go now we have kids… that lodge looks amazing! Wow what a wonderful and most deserved treat for your family. It looks like a really beautiful lodge and a great base location for exploring the lakes.